Vacationers from the U.S. make up the bulk of Mexico’s visitors, and the major drop-off in travel resulting from the swine flu epidemic, drug-related violence, and the current recession has hit Mexico’s tourism industry hard. Travel providers are responding with major sales. Right now, American Airlines is running a sale for travel to Mexico with fares from $176 round-trip between New York and Cancun for travel between August and December. Tim Winship recently named Mexico a top frequent flyer award destination for July, and also rounded up a bundle of hotel reward program offers at resorts in Mexico. 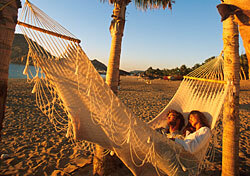 Liberty Travel is offering free airfare to Mexico on select vacation packages. Stay three nights to get one round-trip ticket. Stay seven nights to get two round-trip tickets. Pleasant Holidays has discounted Mexico air-and-hotel packages, from $305 per person. The Los Cabos Tourism Board website has a Los Cabos a la Carte deal, with offers such as free room nights, resort credits up to $350 per day, room upgrades, complimentary meals, free golf rounds, and more. Grupo Posadas, which operates Fiesta Americana and Aqua resorts in Cancun, Puerto Vallarta, and other popular beach destinations, is offering 50 percent off the nightly rate, plus 25 percent off food, beverages, and spa services, for stays through December 23 that are booked by July 31. Rates start at $55 per night. The Ixtapan Spa Hotel and Golf Resort is offering 20 percent discounts on all-inclusive spa, golf, and sports packages through October 4. For instance, the four-night, five-day Spa Classic package, which includes 16 spa treatments and three golf or tennis lessons, costs $616 per person (based on double occupancy) with the discount. Occidental Hotels &Resorts is offering low nightly rates, complimentary nights, and free stays for children 12 and younger through December 20. The offer is good at six of the company’s all-inclusive resorts. Rates start at $57 per person, per night. During Fairmont Hotels & Resorts’ 7 Day Spectacular Sale, rates at three Mexico properties are up to 20 percent off, with rates from $149. The offer also includes a free third or fifth night (depending on the property). Stays must be booked by July 27 for travel through September 30. Know of another sale on Mexico travel? Post it below!